"Graphene's usefulness on Earth has already been established in the last decade. It is now an opportune time to expand its prospects for use in space applications—an area touted as being the most challenging to modern technology—and shift the paradigm of materials science. Space is the final frontier for graphene research, and I believe this is the first time that graphene has entered the stratosphere," said project leader Professor Antonio Castro Neto, Director of NUS CA2DM. "To move a spacecraft over long distances in space, huge accelerations and speeds which are only possible with very low mass equipment are needed. Graphene is the ideal material as it is among the lightest, yet strongest, functional materials we have. 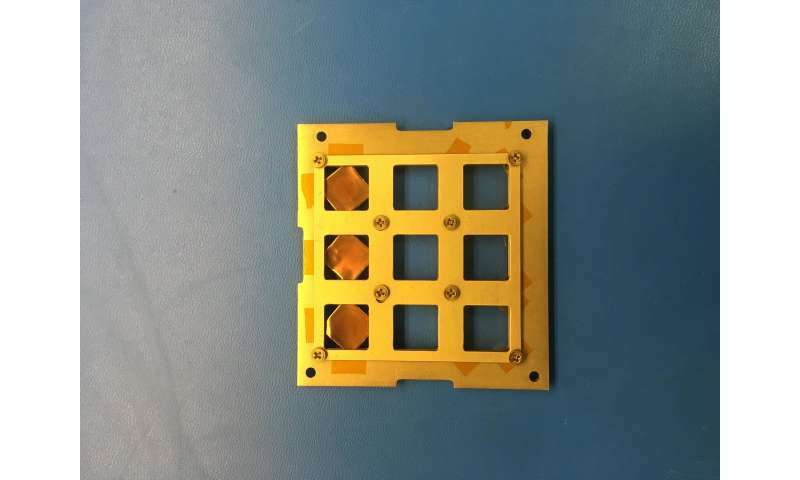 In addition, the high electronic performance of graphene makes it a prime candidate to handle the lack of oxygen and low temperatures in space," explained Prof Castro Neto. To put graphene's versatility to the test, a team led by Professor Barbaros Özyilmaz, Head of Graphene Research at NUS CA2DM, prepared the material by coating a substrate with a single layer of graphene which was about 0.5 nanometers thick, over 200 times thinner than a strand of human hair. The sample was securely assembled within a Boreal Space 'Wayfinder—Mini' CubeSat, and placed in the payload enclosure of the sounding rocket. During the launch, the spacecraft was sent into suborbital environment, and the graphene material was subjected to harsh conditions like rapid acceleration, vibration, acoustic shock, strong pressure and a wide range in temperature fluctuations. The sample re-entered Earth's atmosphere after a 71-second flight, parachuting to a landing in the Mojave Desert. "If this research collaboration is able to demonstrate that graphene maintains its various properties and features after being launched into suborbital environment, it will open up exciting new opportunities for graphene to be incorporated into technologies suitable for outer space and aerospace missions. Such technologies can include electro-magnetic shielding, efficient solar power generation, and excellent thermal protection," said Prof Castro Neto. Ms Barbara Plante, President of Boreal Space, added, "We are very excited about raising the technology readiness level of graphene and promoting its utility in space. I am convinced that graphene will play an extremely important role in space commercialisation. This and future launches support the demonstration of future uses of graphene-based technology in space." In addition to the NUS graphene experiment, the Boreal Space 'Wayfinder—Mini' CubeSat also hosted Gallium Nitride magnetic field sensors provided by Stanford University's Extreme Environments Lab (XLab). The Stanford team is looking not only to obtain important experimental data such as launch load survival and electronics signal integrity, but also insights into magnetic interference, noise reduction and radiation effects on their sensors.